The Galaxy Note 5 stands out not just the obvious stylus-infused narrative. Being Samsung`s first device with a curved class back, the Note 5 add a beautiful seamless curve quality to the rear, thus making it much easier to hold even with a bigger 5.7-inch screen. The curvier back is what set the phablet apart from the S6 Edge Plus, which was announced at the same time last fall. 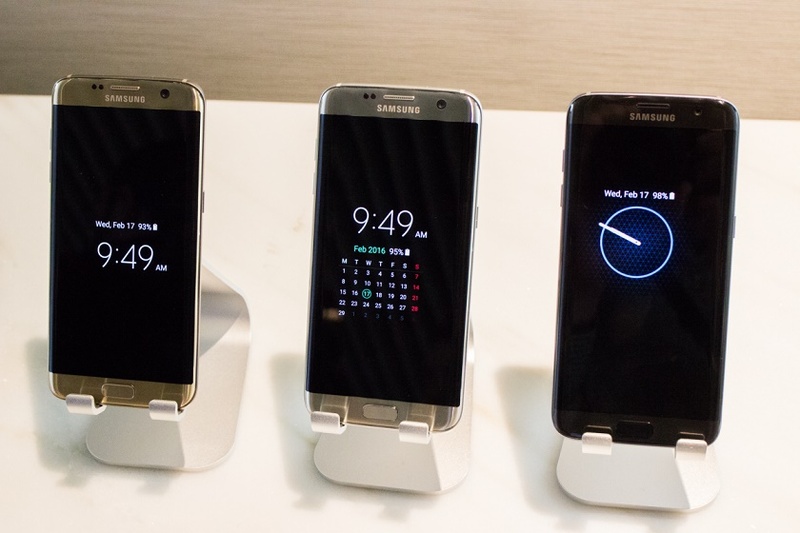 As for the Galaxy S7 Edge, the design is the combination of the both Note 5 and S6 Edge Plus in one mold, which boasts advertising phrase of "Curved Front And Back." Although the S7 Edge looks slimmer on both sides, in reality, it is almost the same thickness when taking the front and back protruding glass into consideration. The exceptionally side bezel makes the device harder to pick up from a desk, and the handling is also more flimsy compared to the bigger rim Note 5 which has better grip. If you are the active type of users who are always looking out for the latest lifeproof water-resistance case, now you can save a few hundred bucks with the S7 Edge. Being IP68 rating means it can withstand Singapore weather no matter rain or shine. You can also enjoy taking some pictures while swimming within 1 meter in 30 minutes. It may be waterproof and dustproof although I can`t really say it is totally shockproof as the phone is covered with breakable glass. Users may want to invest in a Spigen Rugged Armor or UAG case for extra cushioning. Having said that, the Note 5 is not for the rugged users. Its strength lies within the pressure-sensitive stylus which is a productivity tool for business and designers alike. Simply pop it out for a quick note, crop a drawing and write on a PDF file. Use your imaginative to explore limitless possibilities with the S Pen on hundreds of 3rd party applications available. Resolution aside, the Galaxy S7 edge has a slight advantage over its counterpart by utilizing the Always On display running on the latest Marshmallow 6.0 Android OS. Constantly pressing the home button to keep abreast of any missed notifications is a thing of the past, you can now view clock, missed call or schedule on your calendar without picking the phone up from the table. In addition, the Edge display now comes with two rows of shortcuts apps you can customize instead of one exist in S6 Edge Plus. You can hold more contacts and apps which you use most frequently at a slide of a finger. 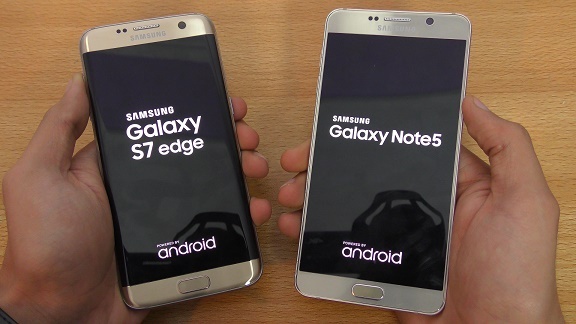 Although the S7 Edge looks and feels more smooth and seamless while watching video or gaming, it is a bit of a redundant when you compare to the Note 5 S Pen UI. Once you spring out the stylus, the Air Command shows up. It has several options for you to select so even an amateur Note users won`t felt lost what to do with it. Given that the 16 MP camera Note 5 has, it may come as a surprise to many when the S7 Edge is shipped with a 12 MP camera which appears to be a downgrade. When dug further, the picture quality does not depend entirely on the Pixel Density but the most matter is the lens aperture that counts. This time round, the f/1.7 is lower than the note 5 f/1.9 which mean more light can go through the lens thus improving the depth of field and faster focusing. The Galaxy S7 Edge outperforms the Galaxy Note 5 during low-light situation. When shooting moving object, the f/1.7 minimize noise to the lowest even when the OIS mode is switched on. When it come to hardware, there`s no doubt both handheld computers are highly rated as the best in the market. 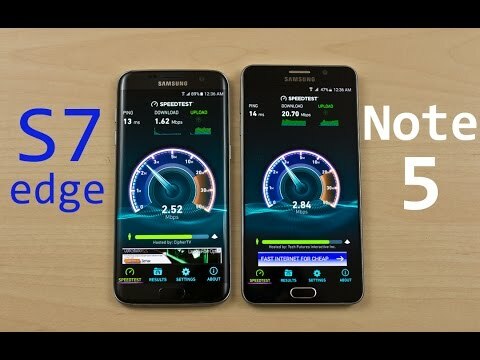 The Note 5 may be using the best in last year technology, but the real deal here is the Exynos 8990 chipset found in S7 Edge which open apps a second faster than the Exynos 7420 found in Note 5. Samsung had upgraded the RAM considerably by introducing 4GB instead of 3GB use in its predecessor. Both flagships are well-equipped with the same amount of RAM and 32GB flash storage. If you`re a heavy user, you may want to consider a higher 64GB ROM Note 5 or for S7 Edge case, expand the storage via microSD card slot. Although the Note 5 may not have this kind of luxury, users won`t mind the lack of memory slot in Note 5 as we all know the are plenty of cloud storage applications eager to give out free memory space up to 50GB when you register an account with them. The two phablets are capable of handling daily tasks and intensive gaming, thanks to their power-efficient chipsets. Both have very good battery life. Raw percentages aside, both devices are powerful enough to handle whatever you throw at them and have power-efficient chips and displays that let them make the most of their capacities battery cells. They also provide very good battery life. The Note 5 lasted 9 hours and 11 minutes of constant simulated on-screen use, and chances are the Galaxy S7 edge will beat its record, thanks to its newer chip and significantly bigger 3600mAh cell. On another hand, mobile gamers would probably prefer of S7 Edge`s unparallel performance and screen resolution is that the handset supports Vulkan advanced graphics API, which allows game developers to explore more boundaries and take advantage of its peer power. The new Game Lounge app on the Edge screen allows easy notifications dismissing while busy playing game, recording you favorite gaming moments and additional gaming functions on the Edge screen. 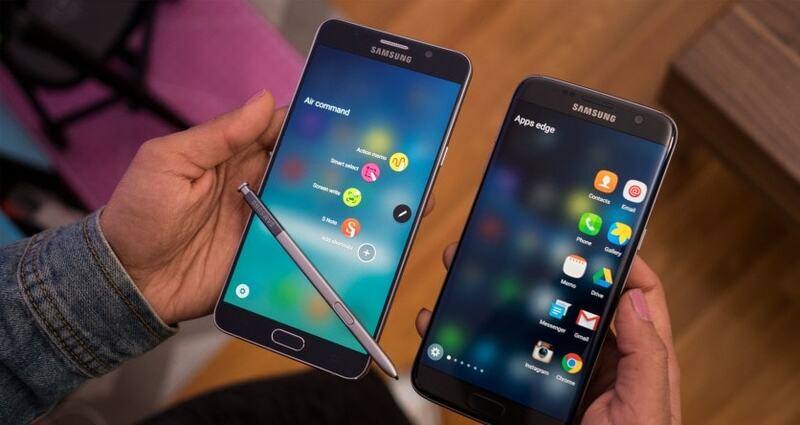 The most deciding factor when one choose between the two flagship model is the S Pen or the Curved Display. Mainly because there are too many similarities between the two. QHD Super AMOLED display, 4GB RAM, and Fingerprint Sensor to name a few. 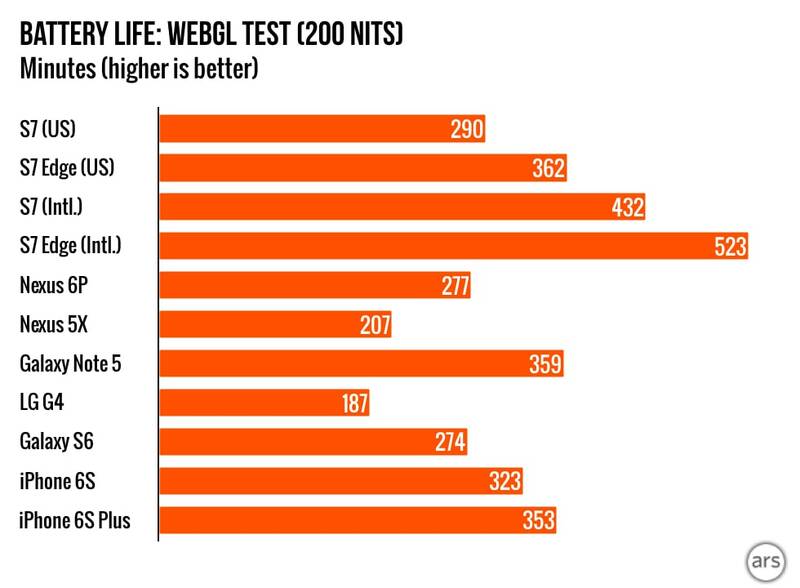 Even though Exynos 8890 is of higher specs than the Exynos 7420, the Note 5 proved capable of handling the most demanding tasks and applications when pit against each other on AnTuTu Benchmark ranking. 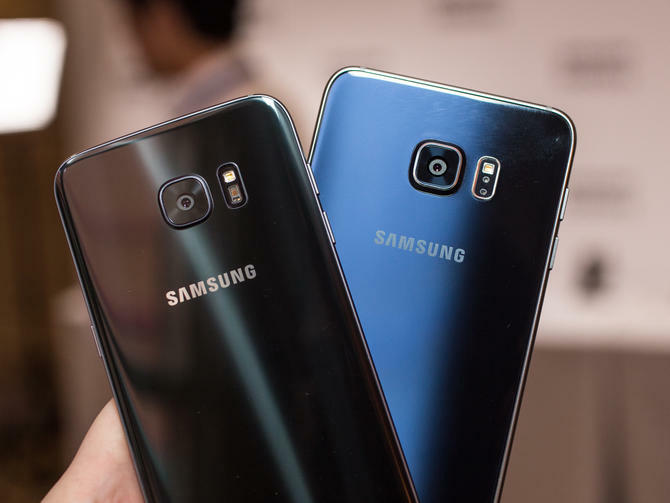 These two are among the elite handset in the industry.